In lieu of flowers memorial donations may be made to Hackleman Cemetery and left at the funeral home. 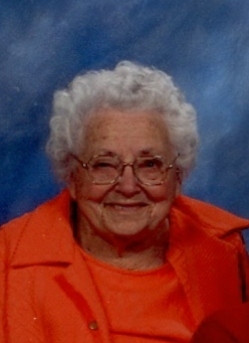 Mary Ellifrits, age 99 years 7 months and 2 days, of El Dorado Springs, MO, passed away at Community Springs Healthcare and went home to her Lord on Nov 12, 2012. Mary was born in Webb City, Mo on April 10, 1913, to Irwin and Cinda (Breedlove) Bird. She was the oldest of 8 daughters, all who have preceded her in death. Early in life she lived in Webb City, MO, and later the family moved to Kansas City, KS, where she met and married her husband of 57 years, William (Bill) M. Ellifrits. They had five children: James Melvin, William Irwin (Dutch), Velma Mae (Pat), Wilma Ellen (Cookie) and Robert Earl (Bob). In 1956 the Ellifrits moved to Cedar Springs, MO, where they bought the family homestead and Mary became a member of Caplinger Mills Baptist Church. While attending there she played an important part in the growth of the church. She taught Sunday School for 50 years, served as song leader, and served in other leadership roles until Bro. Arthur and his wife came to the church in the summer of 1990. Mary still stayed a very active and important part in the church until she was unable to attend due to health reasons. It was then she moved to Community Springs Healthcare in Eldorado Springs where she continued to worship God attending the church services held there regularly. Preceding her in death were her husband; and three sons: James Melvin, William Irwin (Dutch) and Robert Earl (Bob). Mary is survived by two daughters: Velma (Pat) Burns of Black Jack, and Wilma (Cookie) Hickcox of El Dorado Springs; one daughter-in-law Jeroldene Ellifrits of El Dorado Springs; 22 grandchildren; 62 great-grandchildren; many great-great-grandchildren and one great-great-great grandchild; and many nieces, nephews, plus a community full of friends that will miss her. Funeral services for Mary Ellifrits were held on Saturday, November 17, 2012, at the Church of God (Holiness) in El Dorado Springs, MO, with Rev. Randy Hayward officiating. Terri Caruthers and Karen Rains provided music. Interment followed in Hackleman Cemetery under the direction of Bland-Hackleman Funeral Home. Pallbearers were: David Morley, Donnie Ellifrits, Billy Bob Ellifrits, Todd Hickcox, Dan Hickcox, and Ray Hickcox. Honorary pallbearers were: William Hickcox and Matthew Hickcox.